Railpictures.ca - Michael Berry Photo: As the first departure of the afternoon for Mont Saint-Hilaire (EXO 810) flies by overhead on the CN St-Hyacinthe Sub, CN 9547 awaits its next assignment in the Pointe St-Charles Yard. | Railpictures.ca – Canadian Railway Photography – photographie ferroviaire Canadienne. 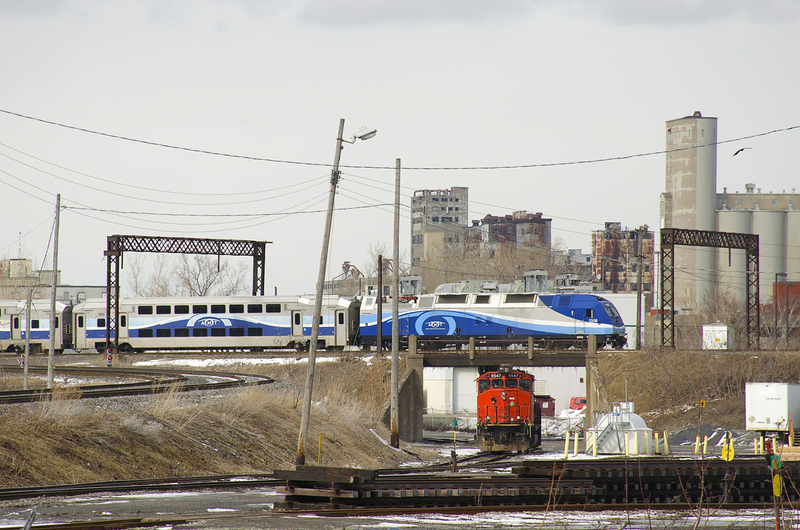 Caption: As the first departure of the afternoon for Mont Saint-Hilaire (EXO 810) flies by overhead on the CN St-Hyacinthe Sub, CN 9547 awaits its next assignment in the Pointe St-Charles Yard.